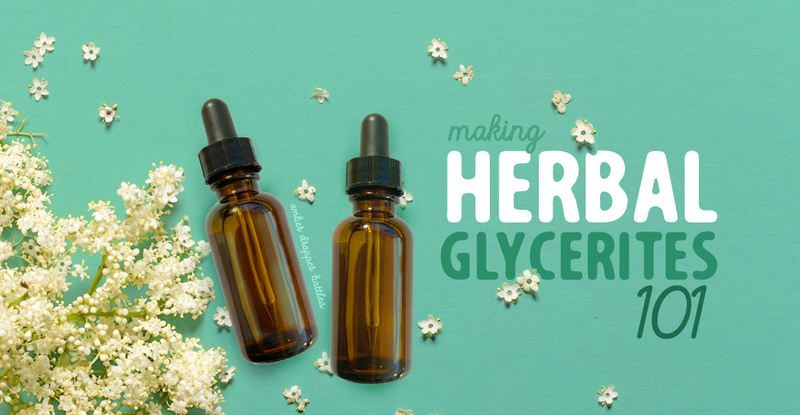 An herbal glycerite is the “free” version of a botanical extract. That is, unlike tinctures that rely on alcohol to extract the chemical components of plant material, a glycerite is made using a medium called glycerin. Derived from animal or vegetable fat, glycerin is a type of sugar alcohol with solvent and preservative properties. As such, it is remarkably sweet tasting. However, it is not metabolized in the body in the same way as sugar nor does it produce intoxicating effects. There are several benefits to using glycerites over alcohol-based tinctures. For one thing, glycerites are suitable for children, pets and others who cannot tolerate or who choose to refrain from alcohol for whatever reason. They can also be added to regular tinctures to sweeten their flavor. And since spring is just around the corner, those delicate violets that will soon be dancing on your lawn are ideal for making glycerites. Ditto for roses, chives, dandelion and other early garden risers. Glycerin is a natural by-product of soapmaking and candle-making that occurs when the triglyceride molecule in animal fat is broken apart by the introduction of potassium hydroxide (lye), releasing three fatty acids and glycerol., the pure form of glycerin. As a substance, it was first identified in 1799 by Swedish chemist Carl W. Scheele after heating olive oil with a lead oxide. He called this clear, odorless, syrupy liquid “the sweet principle of fat.” Glycerin later received its official name from the Greek word “glukus,” which means sweet. Glycerin is also obtained from vegetable fats. In fact, you can make glycerin by heating one cup each of olive oil and coconut oil and then – while wearing rubber gloves, protective clothing and safety eyewear – carefully adding one cup of cold water and two tablespoons of lye. Once the mixture reaches 125’F, add one-half cup of salt, let cool and then skim off the soap curdles that form at the top. There’s also a synthetic form of glycerin that’s made from propylene, a by-product of the petroleum industry. Take our advice: Visit your local pharmacy or grocery and invest in a bottle of ready-made, inexpensive, liquid glycerin made from organic, non-genetically modified ingredients. You’re worth it. Glycerin was largely limited to cosmetic and medicinal use until the latter part of the 19th century, when another famous Swedish chemist by the name of Alfred Nobel discovered something that would make the industrial value of glycerin explode – literally. By combining glycerol with nitric acid, Nobel created nitroglycerine, which could be made into a paste to fill blasting caps (which he previously invented) and used to make controlled explosions for mining purposes. As you may have already guessed, this marked the arrival of dynamite. Since then, glycerin has found its way into many aspects of life that having nothing to do with soap or dynamite. Hollywood filmmakers keep great quantities in stock for use in fogging machines to create a creepy atmosphere, and to prevent props or areas on set from drying out while filming water scenes. (Think about that when you get around to seeing Aquaman.) Glycerin is used in the food and pharmaceutical industries as an emulsifier and sweetener, and in the medical field in ultrasounds and by blood banks to prevent the breakdown of red blood cells when freezing blood. A tour of your medicine cabinet will reveal that glycerin resides in toothpaste, mouthwash, cough syrup and, of course, many personal hair and skin care products, including soap. Glycerin is so useful because it’s hygroscopic, meaning that it pulls moisture from nearby sources. This means its place in hair and skin products helps to draw moisture from the air to your hair and skin. In this way, it serves as a humectant that keeps things moist. However, under certain conditions, glycerin can act as a desiccant that absorbs water to keep things dry. Wait...what? Not to worry. Frequent application of plain glycerin to the skin, especially in very dry climates, does have the potential to strip skin of moisture rather than retain it. But infused with certain botanicals, such as lavender, calendula or lemon balm, a glycerite can be soothing and softening when used topically. And remember: glycerites can safely be taken with tea or juice, too. Peppermint, cleavers, hawthorn berry glycerites are just a few candidates for consumption. Whenever possible, fresh herbs are preferred for making glycerites. Just be sure to harvest plant material after the morning dew has dried. You can also use dried herbs, but you’ll need to reconstitute them by diluting the glycerin with water. Glycerin-to-water ratios can vary depending on the material used, but the standard for optimum extraction and protection from the development of pathogens is at least 55% glycerin (but we’re going to use 75%, or 3:1). Fresh herbs can be infused in 100% glycerin. To make the glycerite, place the herb(s) in a clean mason jar – if using fresh, cover completely with glycerin, leaving an inch-headspace at the top; if using dried, cover with 3 parts glycerin to one part water (i.e., ¾ cup glycerin to ¼ cup water). While adding the liquid, muddle the plant material with a chopstick or other tool to “loosen up” the herb and remove air bubbles. Replace the lid, label and place in a cool, dark place for 4-6 weeks, adding more glycerin if the herbs rise above the liquid at any time. Strain through several layers of cheesecloth or a mesh strainer (use a paper filter for powdered herbs), reserving the precious liquid in a bowl. Transfer the glycerite to clean glass bottles with droppers, label and store in a cool place away from direct sunlight. Use within 24 months. Loaded with antioxidants, burdock is one of the workhorses of the botanical kingdom. Add to teas, soups and stews, or use to dilute tinctures. The perfect tonic herb, especially during the winter months. Add elderberry glycerite to tea, syrups or use to sweeten tinctures. Combines well with thyme, lemon balm, hyssop. Use alone or combine with chamomile for internal use or calendula and lavender for use in your favorite skin care formulas. Goldenseal is the source of the bitter compound berberine. The glycerite may be taken in tea or added to other tinctures and extracts. It may also be used in skin lotions and creams. A rich source of calcium and other nutrients, an oatstraw glycerite is an excellent daily tonic. It’s also very good for dry, itchy skin when added to lotions and creams. Use the dried leaf or powdered stevia to make a glycerite. Use to sweeten beverages and liquid foods. Note: Not recommended for baking.